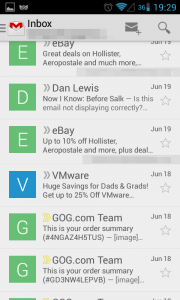 The new Gmail app for Android has been slowly rolling out these past few weeks for multiple devices, and by now the update should have reached most of us. It comes with some new features and a whole new interface, so, let’s see what’s new with Gmail, and what you should be aware of, now that the app has been updated. 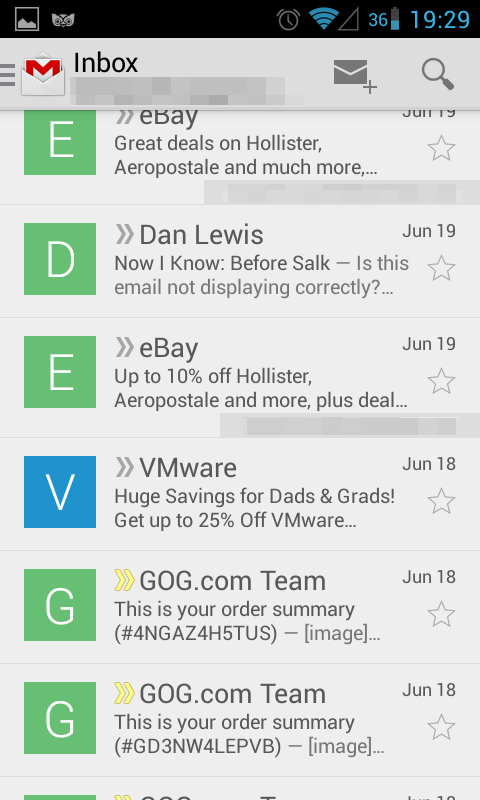 The main focus of this new redesigned Gmail app is the navigation drawer, a design feature that has been slowly leaking onto various Google apps after making its official debut last time around I/O. 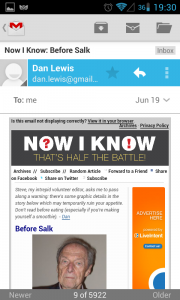 It works pretty much like the drawer on the YouTube app, covering most of the inbox screen when invoked. With this new drawer, you can switch between your various inboxes and labels, including a brand new, automatic “Priority Inbox”, which attempts to filter out the fluff and letting you know about the things you actually care about. Despite it being automatic, you can customize it as needed, but to be fair, it did a pretty good job by itself, at least on my account. 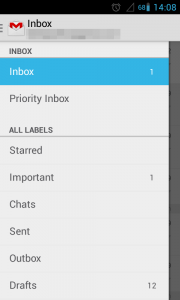 The updated app also shows you all your labels in the same drawer along with your inbox, so you can access your Work label, for example, on the same screen you access your Sent or Draft labels. The old app required you to go to the “All Labels” screen, so this is a welcomed usability change that puts ease of use first. Google has done some thinking outside the box with this one, deciding to display an icon besides every new message you get. This obviously works wonders if you are interfacing with a person you know, or a person that has a pre-made profile, but what happens for contacts you have no info for, or for automated emails? Well, in that case, it will automatically generate an image with a solid color background and the first letter of the contact, which doesn’t look half-bad and helps to identify similar messages. In the case of grouped messages, or messages with multiple participants, the image will be split into multiple blocks, showing you who’s talking. Pretty cool. The old action bar, sitting at the bottom, is no more. Now, the “Compose” and “Search” buttons have found themselves in the top action bar, and the old “All Labels” button is not there anymore (serving no purpose, now). Clicking a message will show you a tiny grey bar at the bottom, serving no purpose other than helping you navigate the structure, as you can now swipe left or right to go to the previous or next message. There is a new bar on the top, which changes according to the possible actions you can do. 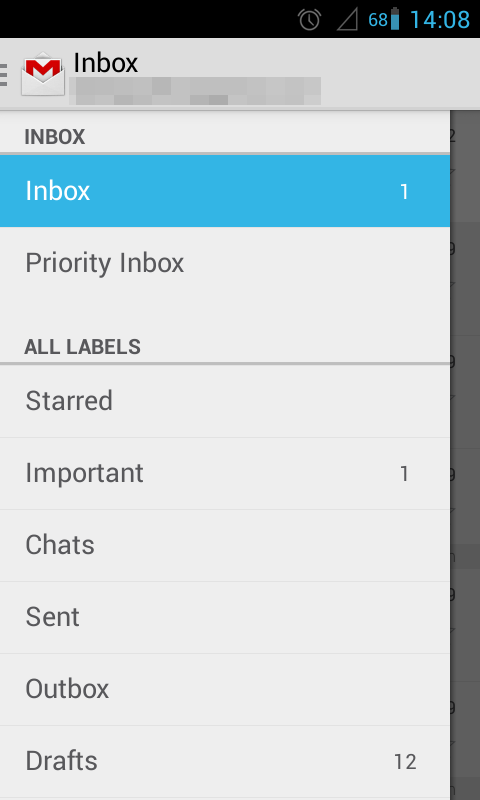 For example, in the main inbox screen, you can search and compose just like usual, but clicking a message changes the icons to archive and move to. Keep in mind, some of the buttons can now be found in other places, for example, the reply icon will be shown near the contact information. All you need to do now in order to refresh your inbox is to pull down and it will show a little progress bar at the top of the app letting you know it’s refreshing your conversations. This can be nice, especially considering the old method, but what I don’t understand is why there is no effect when you pull down. Usually, in these sort of actions, there should be a little rubber-band effect or something to visually let you know what’s going on, but it seems like Google chose not to use it this time. Weird, but not a dealbreaker, as the system does work fine. The update brings a shiny new tablet interface for all you tablet users out there! 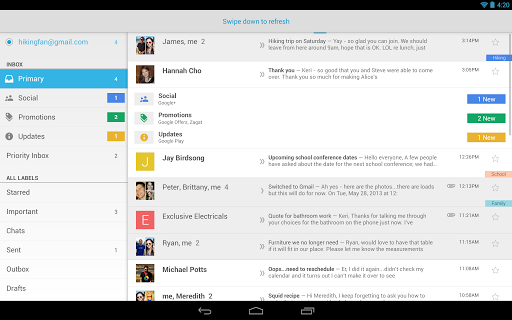 It’s actually pretty gorgeous, and a huge leap from the old UI, in my opinion at least. 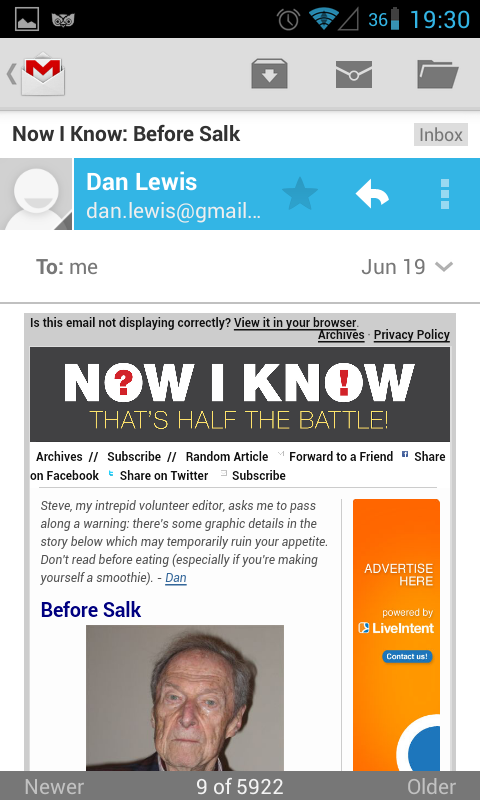 The extra screen space is well-used, and the new picture system for the inbox really works wonders in a big screen. It’s a big leap in usability too, it’s not just for looking good! 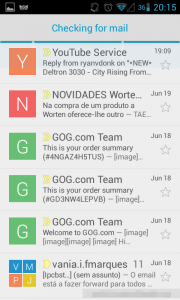 Because of the way the new Gmail app handles and sorts messages, notifications now work in a different way. If you find yourself missing e-mail notifications all of a sudden, it’s because by default the new app makes it so that only priority mail gets to be notified (at least it was as such on my device). This is not a great default, and may cause you to unwillingly miss a message or two so if you’re not sure about the way your mail is currently set up, you should probably go ahead and change the default notification settings so you get your notifications back. And that about does it, see you next time and, as usual, let us know down below if you have any questions or comments! Well, I am not overly enthusiastic with the new layout. Mostly the delete function is now a three step exercise. 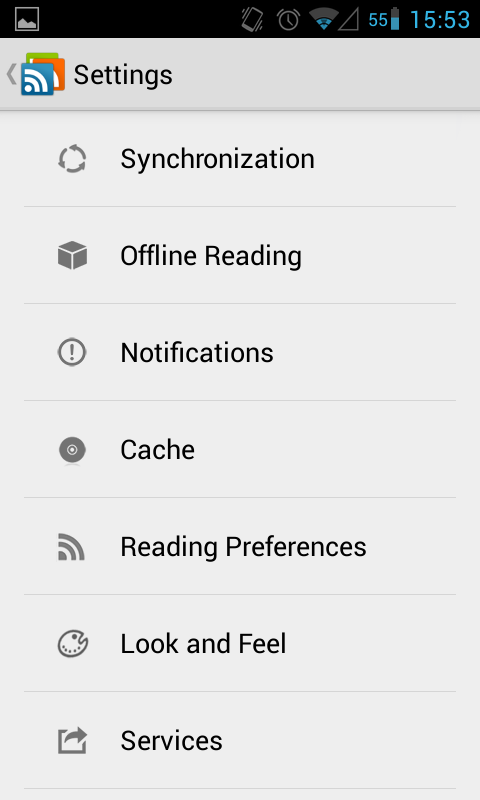 I have read you can configure Swipe to delete instead of archive but haven’t figured it out yet. Low and behold. Just as I wrote the previous comment, I went back to gmail and the garbage can is back. Thank you Google.